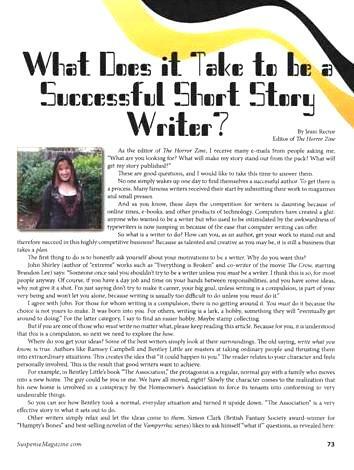 What Does it Take to be a Successful Short Story Writer? These are good questions, and I would like to take this time to answer them. No one simply wakes up one day to find themselves a successful author. To get there is a process. Many famous writers received their start by submitting their work to magazines and small presses. And as you know, these days the competition for writers is daunting because of online zines, ebooks, and other products of technology. Computers have created a glut: anyone who wanted to be a writer but who used to be intimidated by the awkwardness of typewriters are now jumping in because of the ease that computer-writing can offer. So what is a writer to do? How can you, as an author, get your work to stand out and therefore succeed in this highly competitive business? Because as talented and creative as you may be, it is still a business that takes a plan. The first thing to do is to honestly ask yourself about your motivations to be a writer. Why do you want this? I agree with John. For those for whom writing is a compulsion, there is no getting around it. You must do it because the choice is not yours to make. It was born into you. For others, writing is a lark, a hobby…something they will “eventually get around to doing.” For the latter category, I say to find an easier hobby…maybe stamp collecting. But if you are one of those who must write no matter what, you know who you are, so please keep reading this article. Because for you, it is understood that this is a compulsion, so next we need to explore the how. From where do you get your ideas? Some of the best writers simply look at their surroundings. The old saying write what you know is true. Authors like Ramsey Campbell and Bentley Little are masters at taking ordinary people and thrusting them into extraordinary situations. This creates the idea that “it could happen to you.” The reader relates to your character and feels personally involved. This is the result that good writers want to achieve. For example, in Bentley Little’s book The Association, the protagonist is a regular, normal guy with a family who moves into a new home. The guy could be you or me. We have all moved, right? Slowly the character comes to the realization that his new home is involved in a conspiracy by the Homeowner’s Association to force its tenants into conforming to very undesirable things. So you can see how Bentley took a normal, everyday situation and turned it upside down. The Association is a very effective story in what it sets out to do. So now you have an idea. What next? Conrad is saying that writing requires discipline. I used to write two pages one day, then the next day I would edit those two pages. Editing is best after a good night’s sleep away from your work, making you more objective. I recommend being ruthless: remove the bad or the excess that distracts from or bogs down the flow of your story. Stay crisp and concise. And then when you are finished editing those two pages, write two more. Okay, so you must be a writer, you have your great idea for a story, and you are disciplined at your craft. Is that enough? Absolutely not. Next you need to convince an editor to publish your work. This is where I jump into this article. My name is Jeani Rector, and I am the editor of the ezine titled The Horror Zine. I founded this online magazine in July of 2009 as a response to the fact that, probably due to the economic crisis, many of the online magazines that new writers depended upon for exposure either went on hiatus or folded completely. That is why I stepped in to try to fill the void by creating The Horror Zine. 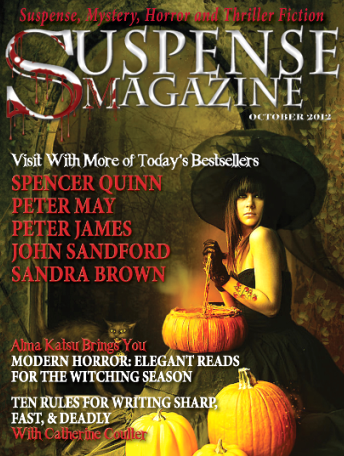 These are my credentials for writing this article for Suspense Magazine: I have over three years of experience working with both new and professional writers every day. The Horror Zine enjoys over 30,000 hits per week world-wide. We are an award-winning ezine that also produces anthology books containing the works of contributors. The Horror Zine consists of myself, Dean H. Wild as Assistant Editor, Christian A. Larsen as Media Director, and of course all of our contributors. The Horror Zine is not just about horror; we welcome other genres such as mystery, suspense, thriller, “Twilight Zone,” and some sci-fi. We do not accept themes that include abuse of women or children, gore for gore’s sake, splatter-punk, erotica, or spree or serial killers. We are a “4theluv” market, but that doesn’t mean we aren’t extremely choosy. We are. One of the reasons why we are choosy in the material we accept is, of course, because we demand quality content. The other reason we are choosy is because we can afford to be. Did I mention there is a glut of writers out there? Of course I did. Which means that you need all the advantages you can get to make your work stand out from the pack and get the attention of editors such as myself. First things first. When getting ready to submit to an editor, remember that it is similar to a job interview. Appearances matter. Read the Submissions Guidelines carefully. If it says to single space at Times New Roman font 12, do what it says! Never submit your work with typos or misspellings or grammatical errors. Have a second set of eyes read your work before you ever submit it to an editor. Right or wrong, if your work contains errors, the editor will assume you don’t care about your story, so why should she care either? All editors expect your best so give your best. All stories need a “hook” in the first three paragraphs. That is usually the length of time a reader will “try out” your work. If he/she is not grabbed and absorbed within the first three paragraphs, he/she will simply stop reading and go elsewhere. Did I mention the glut in writers? From there, I can only tell you what I look for personally when I receive submissions for possible publication. First and foremost, if the first paragraph is devoted to descriptions or (horrors!) a rambling account of history (the why the story is being told), I immediately reject it without reading any further. I recommend starting the first paragraph smack in the middle of the story, in the middle of the action, and then gradually weave the descriptions and history into the body of the story. That sort of thing takes talent to achieve. It is also important to balance the amount of dialogue to the amount of action. Too much dialogue and you are “telling” the story instead of “showing” the story. I automatically reject any story that is told in the form of a diary or someone recounting an event that occurred previously through lots of dialogue. That sort of story is told in a passive voice. There is no suspense to an event that has already occurred. I want stories that are “in the moment;” that are occurring as we speak. Now I will discuss “style.” What is your voice? “I read a story of hers in an Alfred Hitchcock anthology, and it took place in East Texas and was written in East Texas vernacular, and at that point my life changed. I was already writing, but I was trying to write like a New Yorker or someone from Los Angles, and in that moment, when I read [Ardath’s story] “Crawfish,” my brain switched and went South where I belonged. I’ve always thought career-wise that there were some major turning points for me, and my reading of “Crawfish” was in some ways the second most important. “I had been trying to write about things I didn’t know and people who lived in places I had never been, and about things I had never experienced. “And then I read that story, “Crawfish” by Ardath Mayhar, and things changed. Hers was an East Texas voice, at least in that story, and it was not too unlike my own real voice, and from then on, I knew what to do. Now you are done with your story: you have a finished product that has been polished and is free from errors. You just know that all the editors to whom you submit will be thrilled to have it and your story will be automatically published. I try to stress to contributors that opinions are subjective. Different editors have different tastes. What I suggest is that if you get a rejection, query the editor as to why. A real writer, the one with the compulsion to write, wants to do what it takes to better his/her craft. The goal is to produce the best product possible. And for that, the real writer needs to not only seek advice, but to listen to it. So there you have it. I will close this article with one more quote about the challenges of being a writer. Are you up to it? If so, you might be a real writer!